Beezy can be strong but in Cactus & Sea Salt he can be explosive!! LOL @ soap for dinner! I really cannot get on board with Cactus & Sea Salt, it is too aquatic for me, it makes my nose wrinkle. I think I may regret not ordering from Beezy this last pre-order. He has some great sounding scents up. I'm regretting not ordering from a lot of vendors recently. I need to melt through what I have, though. Maybe some sort of melting challenge will convince me to melt faster. I don't know if that's possible, though. I melt several scents and change them out several times a day if I'm home. I think the issue at this point is I'm never home LOL. 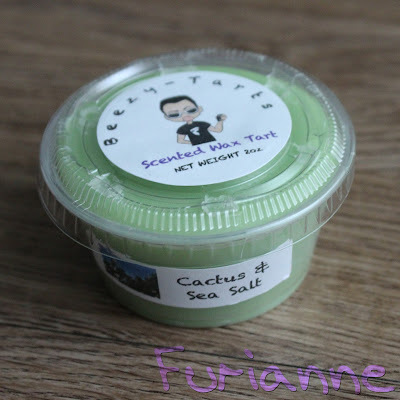 Cactus & Sea Salt is VERY aquatic. I have to be in a special beachy sort of mood for it, which fortunately is pretty frequently. I keep switching between "give me fall" and "let's go to the beach!"